Almost everything that you buy these days has come out of a factory, probably based somewhere in the Far East and whilst the quality is generally serviceable, it often isn’t. Quality has always come at a price, and more people are rediscovering the advantages of using a well-made basket, or correctly balanced tool. Something that has fascinated Alexander Langlands for years is looking at the way that we used to make and do things. As an experienced experimental archaeologist who has appeared on many BBC programmes alongside Ruth Goodman, Peter Ginn running a farm set in different eras, he has learnt the techniques and the ways that they farmed in those days. 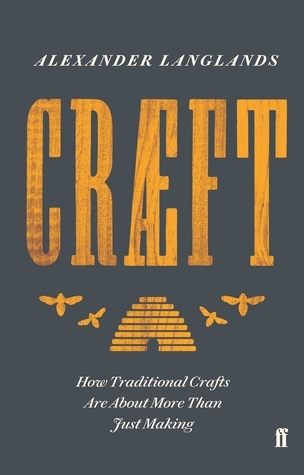 His fascination or borderline obsession with crafts of all sorts has led to him considering it in a wider context. He calls this cræft. He considers it more than that just being able to make a useful object with your hands that you can use, it is sometime about technique, using limited resources in an intelligent way. A scythe is a good example. For large amounts of ground to cut, a form of mechanical mower will save you time, but not necessarily money. However, if you only have a small amount of land to cut with a bit of practice you can cut it in around the same time as it would have taken with a strimmer. 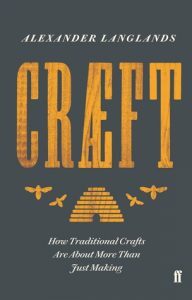 There are plenty more examples in her, from coracle building, dry stone walls, beekeeping and the alchemy that fire can bring to materials. A properly made product can last for a decent amount of time, are sustainable in the materials they use and can be readily repaired, unlike most modern things that break too soon, and get slung in the bin as there are no spares. It is an interesting book and Langlands is an entertaining writer. He picks up on the themes in Why Making Things is Good for You by Peter Korn. They are both right about the process of discovering, researching and making an item with our own hands is far more fulfilling that staring at a screen. It does occasionally ventures into hipster territory I think that it suffers from the a romantic view through rose tinted hand crafted spectacles of what was for a lot of people in the past hard and back breaking work.